site ikwereka amafoto y'abakobwa baba muri Canada bashaka abagabo niba rero ushaka umugore nakubwira iki. Join over 100,000 active single members. Dating service offers dating chat, search, and Web personals with features such as photos, profiles, email and voice messages. Free to join. Personal ads providing people from africa, african descent and their friends a fun and interactive ways to meet create, friendship or possibly beging a new romance. 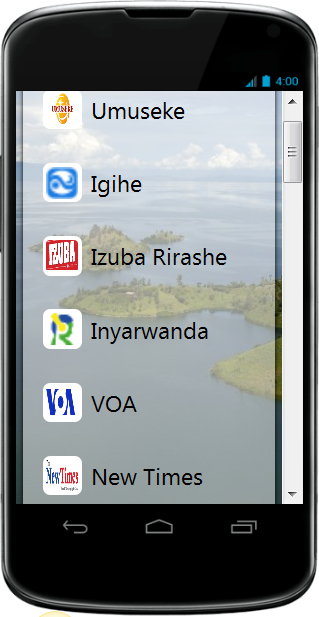 Site sous forme de voyage virtuel basé sur la vie, la beauté et l'artisanat du Rwanda. La majorité de ces photos inédites sont personnelles. A muzungu's (westerner's) observations of life in East Africa. Filled with insights, encounters, travel tips, stories and pictures. Guhuza urubyiruko no kungurana ibitekerezo hagati y'urubyiruko rw'abanyarwanda aho bari hose ku isi.